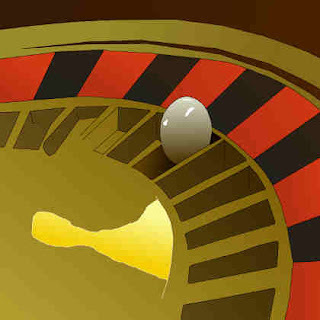 Roulette is a great gambling game with a difference. It doesn’t use cards and it doesn’t use dice (like most other games to be found at a casino). Instead, roulette (meaning “little wheel” in French) uses a wheel, pockets, and a ball. There’s not much to the playing of Roulette. In fact, players pretty much just place their bets and wait for the game to play itself! Once the wagers have been played, the wheel is spun in one direction with the ball being thrown on to the wheel in the opposite direction. Players wait anxiously to see where the ball will fall. It can fall in any one of the 37/38 colored and numbered pockets on the wheel. The numbers go from 1-36 and alternate between red and black. There is a green 0 (and 00 depending on which version of Roulette one is playing) as well. But the pockets do not go in natural numerical order around the wheel. Red and black are not always consecutive either. square layout); and sixline (two adjoining “streets”). Outside bets are less complex since there are only two types: even money (betting on 18 numbers) and group bets (betting on the first, second or third group of 12 numbers). There are two types of Roulette: European and American. 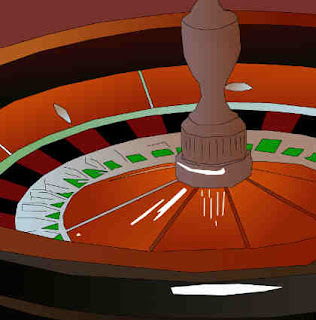 The main difference between these two types are that with European Roulette there are 37 numbers on the wheel and with American Roulette, there are 38 numbers. In the former there is just a 0 (plus 1-36) and the latter has 0 and 00, plus 1-36. Anyone can work out how to play Roulette. It is a fun game to play and differs quite substantially from most other traditional gambling games because of the wheel and ball as opposed to cards or numbers. The excitement comes in the waiting and it is almost impossible therefore to strategize on winning this game. The main aim therefore with Roulette is to just have fun.